The essential cold-weather vegetable. 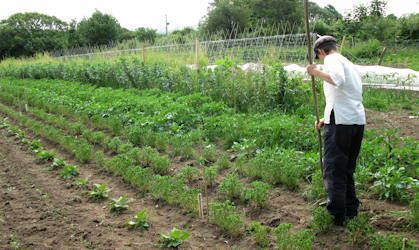 Sanda is extremely cold hardy for harvesting throughout the winter. We like it because it makes nice round tight sprouts quite early in the year, but then stands well for a long time overwinter . This is an old favourite of ours. A rare sprout that is almost extinct, there are just a few kilos of seed produced worldwide each year. That's a shame - it is an excellent variety, ideal particularly for more exposed positions, as it has very tight sprouts on shorter, compact, sturdy plants - They are only 2ft tall (compared to 2ft6 for a normal varietey) You get just as many sprouts, they're just squeezed in more closely together on the stem. So, it is a good choice if you have problems with the wind blowing your sprouts over. Stands well through the winter. Sturdy, ideal for exposed sites. Seed is very hard to obtain, so consider saving your own. A renowned heirloom variety relied on since it was introduced in the 1880’s, with compact plants that don’t blow over so easily - with closely packed sprouts. It prefers longer cooler summer seasons but will grow in most climates. An old Dutch strain with a good reputation for producing large numbers of nice tight sprouts. In scientific studies of vegetable pests it has been found to be particularly resistant to insects and disease. 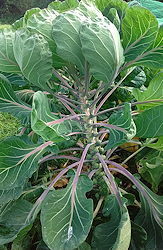 Well regarded as one of the best of the old fashioned sprout varieties still in existence. But it is tall, so not for windy sites. Brussels sprouts are in the same family as Broccoli, so follow the pictures there.